"Extra" will be paying special tribute to the men and women of the U.S. military from coast to coast on Friday, November 11th. Mario Lopez will host "Extra" from the the nuclear powered aircraft carrier USS Carl Vinson, as President Obama makes a special appearance aboard. 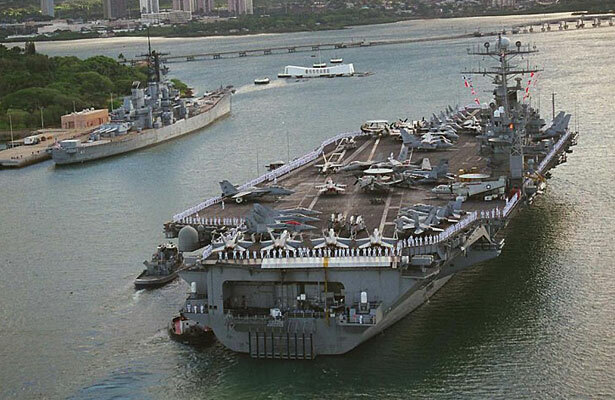 "Extra" will also be on-hand to cover all the events throughout the day, including the Quicken Loans Carrier Classic basketball match-up between North Carolina and Michigan State, marking the first time a college basketball game has ever to be played on an active aircraft carrier. The White House confirmed that President Obama will attend the game, along with other top Navy officials and congressional delegations from North Carolina and Michigan. Former NBA pros James Worthy and Magic Johnson are serving as honorary co-captains for their almae matres. The game's half-time show, sponsored by State Farm, will feature a special hoop shooting contest called "Vinson," featuring Lopez, Worthy and actress Brooklyn Decker. While appearing on "Extra" last week at The Grove, Worthy challenged President Obama to a one-on-one match. Let's see if the "Nation's Basketball-Player-in-Chief" will accept and step on to the court. The Veterans Day tribute continues with "Extra" host Maria Menounos in Los Angeles, welcoming over 200 veterans to The Grove. On the east coast correspondent AJ Calloway will be in New York City at the Veteran's Day Parade with actor Cuba Gooding and Medal of Honor recipients.